I found this pattern while looking through the designs of "Drops". I love to make things with mitered squares. At the same time Demian handed me a skein of Rayon Metallic in a newly revived color "Tapestry" dyed over copper metallic. I had to use it. I don't usually leave projects undone because they are hard to reconnect with but I dropped everything and planned to make the Drops scarf. I gathered colors in a pile but the effect of the Tapestry seemed to be diminished by the jumble of colors. So I thought, "Let me go in the opposite direction. I will make a nearly monochromatic piece." I picked a Sock Plus color in "Deep Shadows" , a greyer but similar colorway that popped the brighter colors of the rayon. 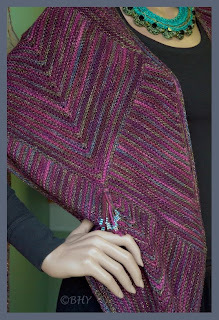 Unfortunately the copper metallic doesn't show well in the photo but the combination produced an elegant sparkly shawl. There were quite a few threads left to deal with. I wanted the back to look as good as the front so instead of weaving them in I decided to incorporate the threads into the design and they became the beaded tassels. I like finished edges so I crocheted several rows around the outside. I am happy with the result. 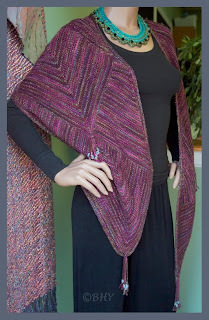 Just after putting the shawl on the model (I must give her a name) I received a package in the mail. It was a beautiful crocheted necklace by Denise Hagood of "Reason To Be" using our yarn. They work well together having some olivey greens that connect them and adding a bit of contrast to the whole.